At 7:15 pm, actress Auntie Wanita recites these lines: “When I am hungry, I cannot eat love.” However, at 7:18 pm seated next to me, a young German woman takes the last two bites of a rolex. She later falls asleep during the second half of the play. Such is the irony within The River and The Mountain, especially embodied in the metaphors for water. Throughout the narrative, are weaved metaphors in the form of rain—which ironically pours outside for the duration of the play—rivers tying each scene to the next, like a powerful memory. 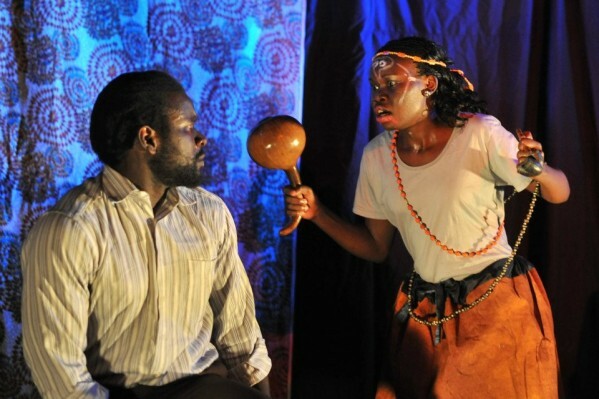 A review of The River and the Mountain, a play written by Beau Hopkins, directed and executive produced by Angella Emurwon and produced by David Cecil of Tilapia Culture, by Serubiri Moses. 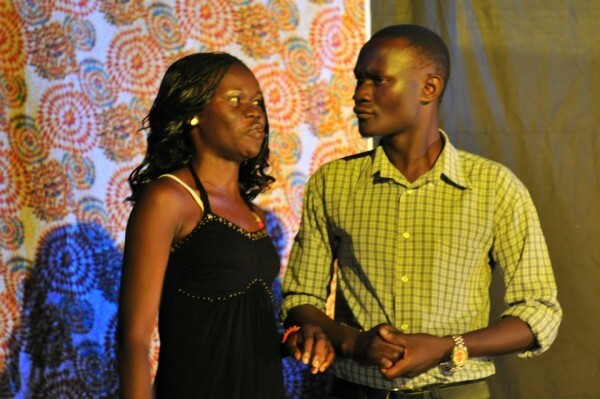 Olu, the lead character, takes a serious tone while speaking about water, which he follows with the lines: “I’ve met someone… I have a friend.” At which point the Pastor, acted by Rehema, is revealed to the audience. Water is the precursor of serious events in the lives of the main characters, as it occurs poetically, preparing the audience for dramatic transformations. Earlier at 5:30 pm, there is an anxiousness in the air for tonight’s performance. Olu goes over his lines in the courtyard, addressing an imaginary audience. It is just after the afternoon rain, and the ground is wet, the air is moist and slightly cold. Beau Hopkins, the writer of the play, walks in with another actor, giving him a note of observation of his performance last night. There is a tense atmosphere, as if the actors have actually realized after last night what gravity this play holds. At 5:35 pm, the director Angella Emurwon, informs the writer that she would like to exclude the cymbal from tonight’s performance, saying its crash sound is too dramatic, and therefore keeps just the conga drums throughout the performance. Beau agrees, saying that the drums are like a heartbeat or an emotional thermometer during the show. David Cecil, producer of the play and proprietor of Tilapia Culture, suddenly slams a copy of the weekend newspaper on the table before Beau, saying his interview with the BBC World Service has been broadcasted. He spoke for six minutes on air, avoiding the over-sensationalized version of the story, instead giving a real sense of what the actual personal drama is, as well as the vast layering that is involved. 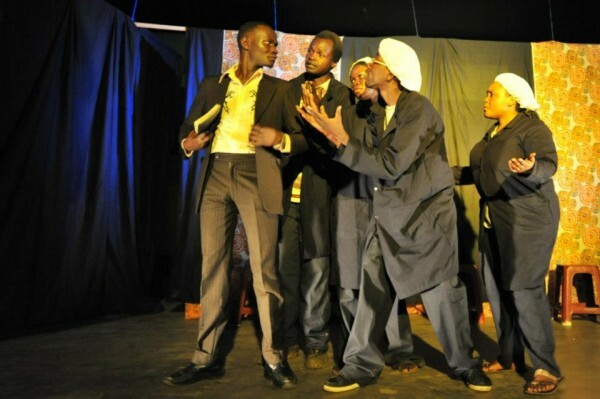 Three days ago, the Uganda Media Council convened for a meeting, making a decision to temporarily suspend the staging of the play, and therefore banned any involvement from the media. Angella ran through the hallway singing “David is going to tell the UMC story!” The entire cast hovered around him like butterflies gravitate towards a string of ribbons blowing freely in the wind. At 7:35 pm, Dre, a chorus actor whose current role in the scene is a radio presenter, pulls off an impressive performance, relaying the speed, music, timing and especially the gullibility of the media. He is supported by more of the chorus actors who call in live on air. A genius stage development by the director, Angella, in which the spotlights are switched off leaving only side lighting, in which each persona stands side by side, and speaks only when it is their turn to command the air. The other chorus line, partly behind the curtain, occasionally breaking out on cue into song, which is a part of the radio presenter’s lines given a bit of melody. Their synchronized timing and accuracy overwhelms me. It reflects Angella’s effort at getting the actors to bounce lines off each other effortlessly. This is not the only representation of the media, as Aida, a news reporter and colleague to Samson, publishes a story that declares him the new CEO of Bebo Cooking Oil Company. “Samson, this will be a scandal!” She convinces him. A pastor, acted by a chorus, uses heavy advertising and politically motivated statements to pull in his flock. “Uganda belongs to us!” “Remember! Visit www.ugandabelongstous.com”. 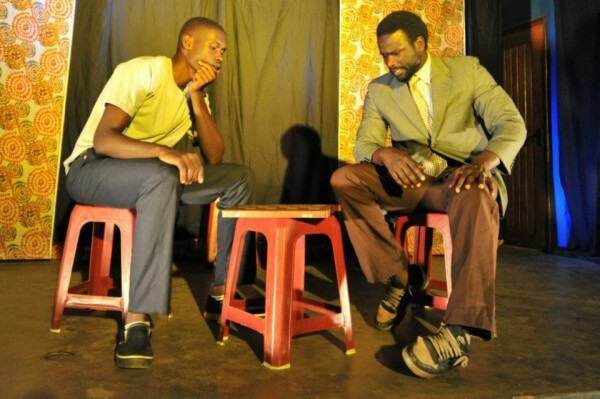 “Several actors turned down the production, because they thought their reputation would be at stake… some had tried threatening us that ’they are using you!’” Bwanika, a chorus actor in the play, explains alluding to the media firestorm surrounding gay rights activism. It turns out however, that all of these naysayers had actually auditioned for the play beforehand and, indeed, had not made the cut. The cast consisted of well-known Ugandan film actors, like Prynce of the acclaimed State Research Bureau, as well as Auntie Wanita, who took a central role in the casting of—as well as taking an acting role as one of Idi Amin’s wives—in The Last King of Scotland. And yet despite their fame, they were all bonding like brother and sister, at the insistence of director Angella. Olu continues to talk about the River people and the Mountain people. Samson’s mother tries desperately to “cure” him. She attempts everything but in vain. “The highlight was the witch doctor,” someone mentions during the 15 minutes break after act 1. The conviction in which the witch doctor—again one of the chorus—carries their lines with such confidence and understanding fully the character of manipulation; when she delivers the line “Completely cured for one year”, the audience almost hesitates to laugh, showing how much Beau makes use of dark British humor. For some reason, I cannot get the line out of my head: “You seem like a distant mountain to me, Samson”. A line which the actress Wanita interpreted extremely delicately, and you could hear how drawn in the audience was as the theatre cooled to near silence. I feel that line defines the struggle and drama of the play. The writer’s determined struggle to understand the gay character of Samson, who keeps denying him the right to say “I am cured”. It feels as if the writer had no other choice than to see Samson this way, not having any idea of how to solve the problem of Samson’s sexuality, seen through the eyes of a mother. “I am going to take away a lot. We need to remove our placards… the tree is in the garden,” Wanita says, pointing to a bush through the window. This tree she is talking about comes rushing back to my mind. “Like a distant mountain, Samson.” A distant vista, which cannot be seen except on clear days when the clouds are cleared. There is that sense that this is the point which will never be reached; unfathomed. Wanita breaks down and cries. The project was not conceived as a radicalized idea four months ago, when two Englishmen, having known each other a rather short time through mutual friends, sat down over a coffee and decided to work on a stage play. Four weeks later they had an outline and then Angella joined the team as director. Yesterday, I watched as the cast practiced a choral version of the main theme, The River and the Mountain complete with poetic lyrics written by David in a quasi-broadway style. The group gathered around the stage and belted out unhesitantly “It’s the riveeeerrr … and the mountain”, before being abruptly interrupted by Angella asking, “So you don’t sound like a primary school choir?” To which the group vehemently adjusted their harmonies. As the second act grapples with issues of political scandal and religious commercialism, I realize that several of the characters are simply faucets of the same persona. Even, Olu and Samson are the same persona, just like Jesus and Judas were different aspects of the same persona. But the real story occurs when the main characters Olu and Samson meet each other. First as primary school children, where in the play, mother says, Samson played Jesus and Olu played Judas. And then again as adults, they try singing just like in the old days, at which point Samson confesses “You know, I’m gay”. Each meeting of these different faucets of the same persona reflect a deeper meaning, which is the submission to a supreme destiny of sorts, represented by the water that flows throughout the play, whether in the form of rain, river or even on top of an unreachable mountain. However, there is heroism in the willingness to die for what he believes to be the true self, which is the moral of the story. That one can go to such extremes to prove that the self exists. It is so clear that the writer is struggling from the dark to see even the smallest light, turning all that darkness into comedy. It is a painful, crucial process. The second half is where this aspect of poetry plays out, continually cutting, revisiting, and at once throwing everything together. When I frame this through the conservative liberal views of the producer David Cecil, one is prepared—even as they name and set themselves apart by identifying themselves as gay—to become the true radical who dies in martyrdom, a very close allusion to that liberal anarchist and Queer activist David Kato that was found murdered in his own home last year. All photos by courtesy of The River and the Mountain Facebook-page.